PG&E owns and operates the Diablo Canyon Power Plant, whose two reactors together produce approximately 2,300 net megawatts of electricity – enough to serve nearly 3 million northern and central California homes. Cuddy said he wasn’t sure when the Unit 1 reactor would come back online. Lara Uselding, a spokeswoman for the Nuclear Regulatory Commission, the federal agency that oversees reactor safety and security, said the plant is not in any danger. “It’s not a normal operation condition, but the plant is safe and all the systems operated as designed,” she said. Salps are tiny, gelatinous organisms that move by contracting, thus pumping water throughout their bodies. They can reproduce and multiply quickly. Though salps look a bit like jellyfish, they are actually more closely related to organisms that have backbones. They typically grow to 1 or 2 inches long and usually do not appear at the coast, says Larry Madin, a salp expert and research director at Woods Hole Oceanographic Institution in Massachusetts. “They’re typically more of an offshore living organism," Madin says. He surmises that the swarm at Diablo may have been carried in on currents blown by wind. 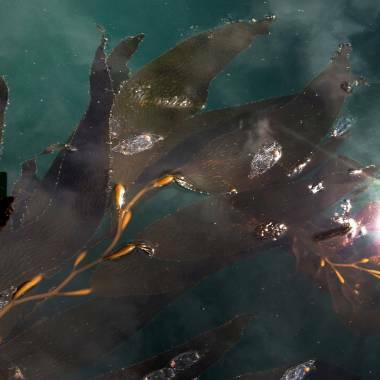 But Steve Haddock, a scientist with the Monterey Bay Aquarium Research Institute in Moss Landing, Calif., said salps have been blooming in high numbers along the California coast since at least December. Several sightings have been reported to JellyWatch, a website Haddock runs to track sightings of jellyfish and other marine organisms. Other than clogging the cooling system filters of a nuclear plant, the organisms pose no danger, says Bruce Robison, senior scientist at the Monterey Bay Aquarium Research Institute. They don’t sting, they don’t have teeth and they’re not poisonous. Salps passively feed off tiny organic particles in the water and can reproduce sexually or asexually. “They can have their population size expand tremendously within a short period of time, which makes them very abundant. In a small space, they can take up all the space,” Robison says. Madin said the slimy swarm at Diablo would probably go away in a few days, carried off by currents. Or, says Robison, they’ll quickly die off when their food supply runs out. So the best bet, experts say, is for nuclear officials to just wait it out in the short term. "Long term, perhaps if their intakes were a bit deeper, it would not be a problem," Haddock said. Despite the reactor outage, California is not expected to experience any electricity shortages because it has ample reserves, said Stephanie McCorkle, spokeswoman California ISO, which operates the state's power grid and wholesale markets. It’s not the first time that sea creatures have interfered with nuclear plant activity. In 2008, a swarm of jellyfish led to a sharp decrease in power generation at Diablo Canyon, according to the Los Angeles Times. Similar jellyfish problems have cropped up at nuclear plants in the U.S., Japan, Israel and Scotland over the years, the newspaper said. “It happens. It’s something you would expect along the coast,” Uselding said. Madin said this is the first time he’s heard of salps interfering with the operation of a nuclear plant.